Hanna with Disney Fairytale Weddings took care of every detail for the couple and their guests. 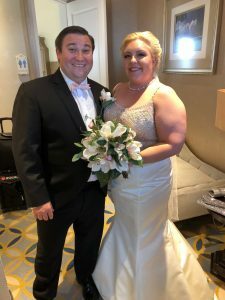 Their wedding planner told them, that from the moment they stepped into their transportation that morning, that Disney’s goal was to make them guests at their own wedding. And they were! Danny and Megan walked down the aisle to beautiful music played on the organ by Bill and accompanied by Rob on the violin. The rich magnolia inspired florals that they wore and carried down the aisle were painstakingly crated by the Disney floral department, just for them. Rev.Glynn Ferguson an official Walt Disney World Wedding Officiant and with the Orlando Team of Sensational Ceremonies worked with Danny and Megan to create a beautiful ceremony filled with touches with love and lots of laughter. He also asked them to write and say why they loved each other. Megan wrote: Today I am marrying my best friend! I love him for always taking care of me! I love him for always knowing what I need just when it need, even if it may not be be what I want! I love how much Danny loves his mother and father! I love how he loves my family! I know Danny is going to be an amazing father, and I am so excited to grow old with you! Mostly I love Danny, for loving me! Danny wrote:Megan is the most Beautiful woman I’ve ever seen. Beyond that she is where passionate love and wisdom collide. She understands that raising great kids will be the most fulfilling duty we will ever have. Intimately, I feel like I can be my true self when I’m with her. She makes me feel like I am the funniest man alive, and I know I can always make her laugh.